Uniquely designed to help provide comfortable, reliable worker protection. 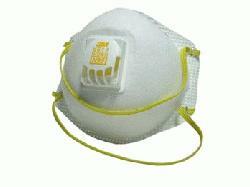 It is ideally suited for work settings that involve heat, humidity, or long periods of wear. Workplace applications include grinding, sanding, sweeping, bagging and other dusty/hot operations. It features the 3M" Cool Flow" Exhalation Valve and adjustable M-nose clip to help provide a custom fit and secure seal.